Bloating is the feeling that your abdominal region is tight or distended. A common feeling after eating too much or eating foods that are hard to digest, it can also be caused by an allergic reaction to peanuts -- one of the most common food allergies. If you consistently experience bloating after consuming peanut butter, consult a doctor to determine if an allergy or other digestive problem is to blame. The tight or distending feeling associated with bloating can occur for a variety of reasons, ranging from overeating to a more serious digestive disease. If you experience bloating consistently after consuming peanut butter, however, it is likely due to either a food intolerance or a food allergy. Less commonly, an underlying digestive disorder, such as irritable bowel syndrome, is to blame for bloating when eating peanut butter. 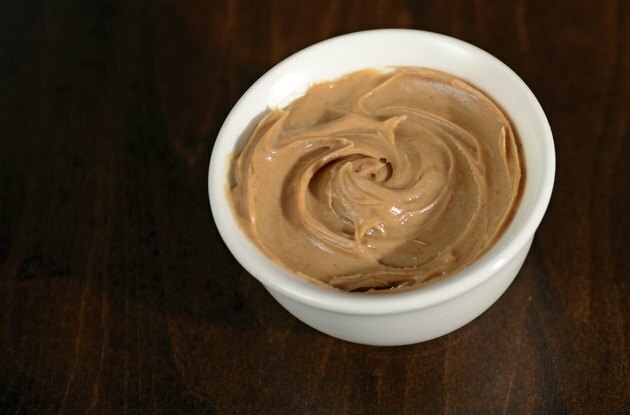 Eating peanut butter may simply exacerbate the symptoms of the disease. Food allergies are often confused with an intolerance to certain foods, but they have different causes. Food intolerance is due to problems digesting a certain food, which can lead to bloating and gas, whereas a food allergy is caused by the immune system. Your body sees the problem food -- the allergen -- as a threat and releases histamine and other chemicals that cause the symptoms of an allergic reaction, which may include bloating. Peanuts are one of the most common allergens, according to the American Academy of Allergy, Asthma & Immunology, along with shellfish, eggs, wheat and milk. Unlike a food intolerance, a food allergy can be fatal in severe cases. Food intolerance symptoms typically include milder digestive problems such as bloating, abdominal cramping, nausea or diarrhea, primarily due to the buildup of gas in the intestines. Food allergies may include similar symptoms but are often accompanied by typical allergy symptoms, such as sneezing, hives or itching around the mouth. More severe allergy symptoms can include chest pain, loss of breath and throat closure. If a digestive disorder is the culprit, bloating may occur after eating a variety of foods, often accompanied by symptoms similar to those of a food intolerance. Bloating that occurs consistently after eating peanut butter requires consulting a medical professional. A qualified health practitioner can determine the underlying cause and suggest proper treatment. Food intolerance often requires simply avoiding the problem food. A peanut allergy also requires avoiding peanuts, but it can be difficult as many food-manufacturing facilities frequently use peanuts in some products and not others, resulting in peanut residue being present in foods not supposed to contain peanuts at all. Wearing a medical alert bracelet or necklace and carrying an auto-injector device containing adrenaline -- to prevent the body going into shock -- is also typically recommended for allergy sufferers. Digestive disorders often require medication as well as diet modification. Institute of Food Technologists: What Is the Difference Between a Food Allergy, Food Intolerance and Food Sensitivity?